Let’s face it. Opening some jars is hard, even for the strongest among us. That’s why a little extra help can come in handy, and it can also help prevent harmful accidents. Especially for seniors aging in place, putting too much effort on trying to open a can or jar could actually cause you harm or a serious accident. If you’re living with weak hands or arthritis, it’s best to take it easy and find an aid that can ensure you’re safety while also getting the job done quickly. 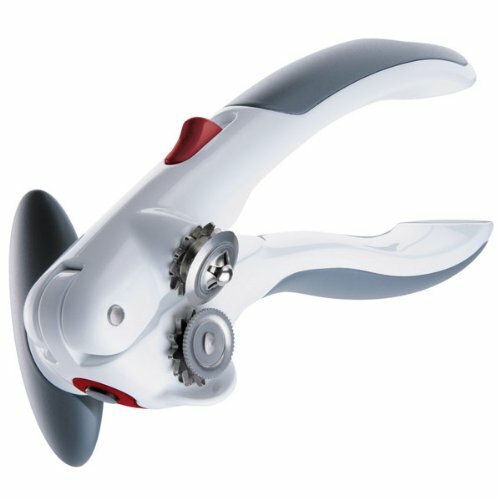 Our Best Can and Jar Openers for Elderly 2018 review shows you some of the excellent choices you have for making life just a bit easier. Who Should Use These Items? What Should I Look For When Buying Them? It is incredibly versatile for a variety of different containers. It has a lifetime, money-back guarantee. You can use it to open flip top lids too. It’ll pay for itself quickly in time and effort saved. The openers are a bit flimsy. The Kitchen Krush Bottle Can and Jar Opener Multi Kitchen Tool solves several problems with the convenience of product. That fact alone makes it a value purchase. The manufacturer also provides a lifetime warranty, so you know it’s a product that will last you a long time. Altogether, it is a wise investment and a must-have for any kitchen. With this tool, you’ll get a pull tab can opener, bottle twist off, jar seal release, bottle opener, and soda can tab opener. For seniors with arthritis, this tool is one of the best options to keep in your kitchen and in your bag so that you can easily travel with it to open bottles on the go. It even handles the lids for hands-free operation. The grip is soft and comfortable. You don’t have to handle the lids. It has a five-year guarantee. It works as described and cuts cleanly. It leverages the cutting action well with minimal effort on your part. The opener may slip when using it on heavier cans. Seniors with arthritis still may not be able to turn the knob easily. The ZYLISS Lock N’ Lift Can Opener is a handy tool to keep in your kitchen drawer that also provides a safer way to handle cans. It cuts through lids effortlessly and uses a magnet to lift them without any hassle. The action used to turn the can opener knob is smooth without a lot of effort required to get the job done. The handle is specifically designed to be soft to touch so that seniors with arthritis don’t need to experience any pain or pressure as they’re gripping the tool. It works with a wide range of bottle sizes. 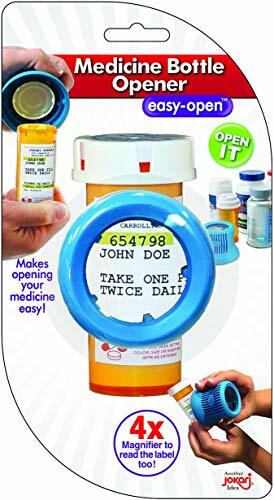 It can open a broad range of pill bottles. You can even use it on twist-off caps and pull tabs, putting it in the multi-tool category. Its bright color makes it easy to find it in your kitchen drawer. It has a comfortable, ergonomically designed shape. It has a 30-day, money-back guarantee. It’s expensive for what it is. The Magic Opener Arthritis Bottle Opener is another versatile product that will likely become indispensable over time. It can open both medicine and beverage bottles in a wide size range. You can use it on more than 16 differently sized caps. That includes different types like pull tabs, water bottles, and large beverage containers. When it comes to arthritis and joint pain, the motion and pressure required to twist off tight caps can cause serious harm and pain. 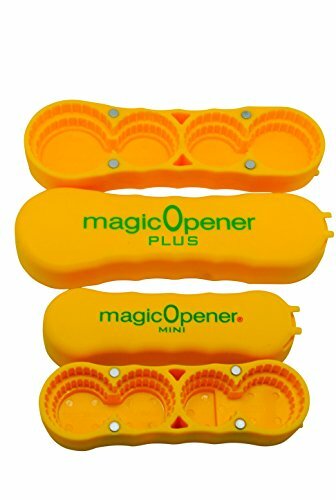 With this versatile opener, however, it channels all of the leverage necessary to remove your caps easily and quickly. Versatility and value make this gripper a great choice. They have a non-slip, textured surface. The bright colors are cheery. You can use them as trivets too. 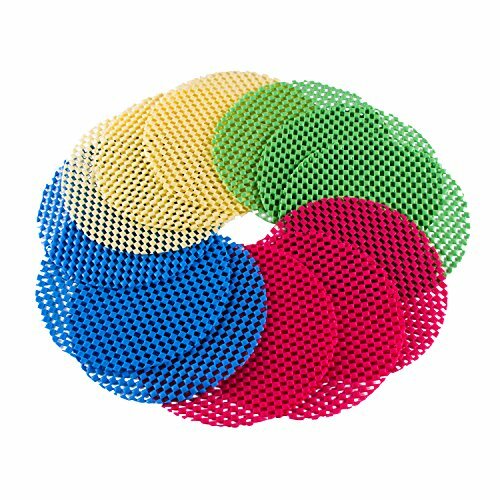 The Super Z Outlet Multi-Purpose Jar Gripper is a package of 12 pieces that serve several functions. 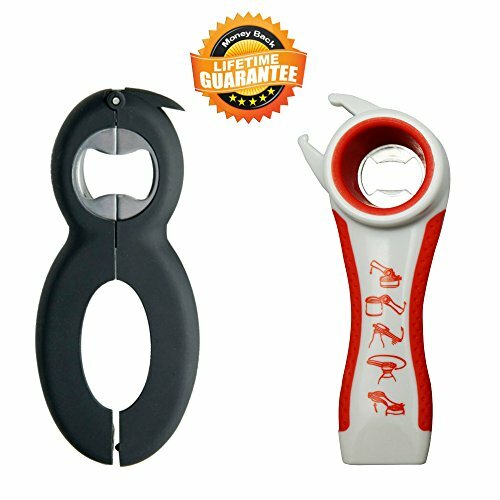 You can use them to open difficult containers because the textured surface provides excellent gripping action that will give you an edge on leverage. You can also place cups or bowls with hot liquids on them to act as a trivet. To top it off, they are inexpensive and versatile. We recommend this product for seniors who may have slight joint pain or weakness, though you’ll still have to exert some effort and complete the same motion with your hands that is required to remove bottle caps. If you have more serious arthritis or pain, we recommend a different product that can reduce more of your effort. It makes the process easy and fully automated. The battery life is relatively long. It has a one-year warranty. It’s built to last for the long haul. It runs completely on its own with the push of a button. The company stands behind its product with prompt customer service. You can only use it on glass jars. The Hamilton Beach Open Ease Automatic Jar Opener is the most expensive item on our list, yet that’s because it automates the entire process of opening jars. 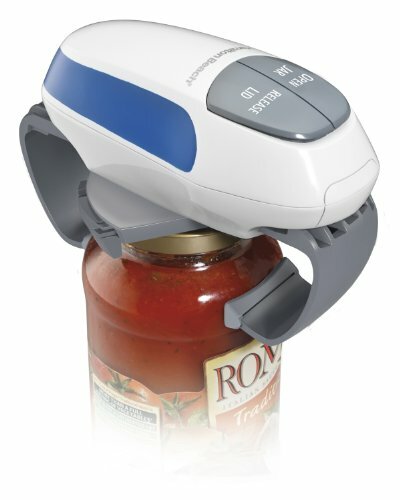 The battery-operated device takes charge from start to finish so you can open difficult jars completely hands-free. The operation is seamless and easy to use with the push of some buttons. We highly recommend this product for seniors with very limited mobility in their hands or extreme joint pain to where they cannot open jars with the require twist motion. This device takes care of everything for you so you won’t make your condition worse or cause yourself unnecessary stress and pain. It’s a simple solution to an annoying problem. It has a comfortable hand feel. The surface is slip-resistant to help you gain leverage. It is flexible enough to fit a broad range of bottles. It provides a secure grip on caps. The magnifying function is priceless. It is less useful for smaller bottles. Material may not be durable enough to last for a long time. The child protection lock that comes on medications is a necessary safety feature for young ones, but it can pose extreme difficulty for seniors. With the Jokari-US 25022 Magnifying Medi-Grip Remover, you can easily open your medicine bottles with a simply designed gripper. The product is made of thick yet lightweight plastic that’s flexible enough to you allow you to grip your bottles without adding pressure to your hand or fingers. The gripper also has a magnifier on the top so it can help you see the exact medication you’re opening, even if you have poor eyesight. This is an important feature to help prevent from incorrect doses or taking the wrong medication at the wrong time. Save yourself the aggravation and opt for the upgraded products to avoid the hassles a manufacturer has already identified. These aids make opening containers easier by optimizing your leverage. Because of this feature, it allows you to get the job done using less effort. The design of these products is shockingly simple sometimes. That makes them both practical and affordable. Most don’t require batteries or electricity either. They are portable and lightweight too. You’ll find can and jar openers specific to many different types of products. Others have universal settings to make them more useful across the board. Our advice is to identify the containers that give you trouble. Then, find an item that can make the task more manageable. To get the most value out of your purchase, choose one that can handle a variety of them. The short answer is anyone who has ever struggled with opening a jar or can. While you’ll often see these openers marketed to seniors, they’re an excellent option no matter what your age is. We all enjoy the prospect of making things more convenient. That’s precisely what you’ll get when using these products. You may find them especially useful if they help open containers you frequently buy. They are also a smart choice if you have any health condition that affects your mobility or strength, such as arthritis. And it’s not just something that effects seniors. Around two-thirds of individuals diagnosed with it are under 65. We appreciate the small but significant modifications that make everyday tasks easier to complete for everyone. Many of these items are ergonomically designed, which makes it easier to get the secure handhold and use leverage to your advantage. Getting a decent value for the price is always a top concern. Make sure that the opener is well-made with quality materials that won’t break easily. There are not too many more frustrating things than to have a new purchase break after the first use. Some manufacturers will back up their products with a full or limited warranty. At the very least, stick to ones that have a satisfaction guarantee even if it’s only 30 days or less. You’ll probably know right away whether or not it’ll work for you. And if it doesn’t, by all means, take or send it back to the seller. To make the most of the product, make sure to read the instructions before you try it out for the first time. Often, not using it correctly will negate the benefits that it offers. If it’s unclear, go to the manufacturer’s website or even YouTube to view a video about the proper usage. You’ll save yourself a lot of wasted effort by doing so. Bear in mind that some products vary in their usefulness because of their size. Larger items give you better leverage but also make them unwieldy to use. Reviews of a product are invaluable for identifying the flaws of an item and extra precautions you need to take when using it. When reading product descriptions, look for buzzwords like “Upgraded,” “Improved Design,” or “2018.” You’ll typically see them on the label or in the description. Often, customers will highlight this information in their feedback too. These notes can alert you to the fact that there is a second-generation version of the opener. You may find an excellent deal on the old one, but chances are that the problems that prompted the redesign will affect your experience with it. Save yourself the aggravation and opt for the upgraded products to avoid the hassles a manufacturer has already identified. Our advice is to stick with the latest one no matter what the price of the previous one. Remember that the manufacturers tend to modify their products once they start receiving feedback from customers that points them in the right direction for a better design. That process can also reveal issues in quality control to ensure that you don’t get a defective one. Finally, don’t let price be the only deciding factor. The old saying about “what you get is what you pay for” applies to can and jar openers too. Think about how much you plan to use the product and let that information also guide your purchases. You’ll likely find that if you invest in a decent item, you’ll make up for the higher cost in the long run. Bear in mind that some products vary in their usefulness because of their size. Larger items give you better leverage but also make them unwieldy to use. It’s a matter of striking the right balance between versatility and effectiveness. You’ll find that companies that specialize in these aids have a better handle on what features make a difference. Our Best Can and Jar Openers for Elderly review showed the many options you have for solving one of life’s common nagging problems. No matter what container is that gives you grief, you can find a product that makes opening it more manageable. Save yourself from the unnecessary pain or stress that comes with not being able to open a container, and make sure you have the correct tools to make the task easier. The products we’ve reviewed are the best for a variety of different situations, whether you only have slight joint pain, or have further mobility issues that require automated options.